I feel I need to add a spoiler alert to this review. While I try to not go into too much plot detail I do drop a couple of essential details into my fevered ramblings. Sorry. I’m lazing out on the couch feeling pretty sorry for myself. Somewhere, somehow I picked up a lurgy yesterday so today I’ve called the Boss and passed on the sad news that they’ll just have to do without me today. I whimpered quietly as the rest of the family dispersed and I gently lower myself onto the couch. What I needed was something to pick me up, something to bolster the good work being done by my gently steaming hot lemon drink and jazz strength paracetamol. My film today is one I’ve not seen before. Is this going to be liquid gold or am I about to waste and hour and a half of my sickly, horizontal day on some poorly written guff? Within the first thirty seconds I’m pretty sure I’m on to a winner. The film opens with a shaky handicam close up scan across the Royal Artillery Monument in Hyde Park, London. Remember this is 1964, I instantly have the feeling this is going to be a slightly subversive film. The cinematography and editing are non-classical throughout. There are cuts to still images and vignettes that illustrate the point being made. In places these turn this film into a black comedy in other it adds a starkly serious, electro-shock of reality to the overly theatrical storytelling. It’s a very British film. 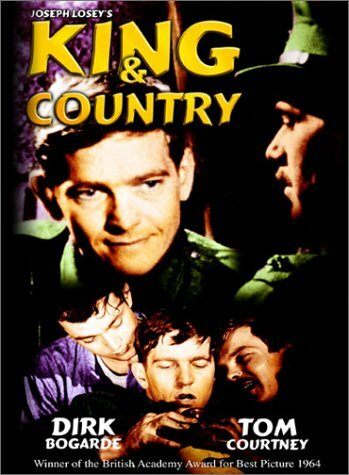 King and Country is the story of a captured AWOL soldier and his subsequent court hearing and judgement. We learn about what causes him to go for a wander. We watch the Officer chosen to plead his case as he initially appears to be going through the motions and then seems to slowly understand the accused’s plight. It is also a courtroom drama as the defence and the prosecution both try their hardest to make their points. On the face of it there are similarities in the plot to Kubrick’s film from seven years earlier, Paths of Glory. They both cover the same initial ground regarding deserting soldiers and their subsequent trial and conviction. But apart from that plot device there isn’t much else to draw parallels between. There are no battle scenes in King and Country, the camera barely moves as we are hemmed into the claustrophobic, behind the lines set in comparison to the sprawling tracking shots over vast trench systems from Paths of Glory. No, these are very different films. There is a strong theatrical feel. It makes sense when I cast my eyes over the short wiki page for this film and note that it was adapted from a stage play. There are these theatrical asides to a group of grunt soldiers who talk to each other as if they’re from some poorly performing off-Broadway play. Are they meant to be the comic relief? I can’t quite work it out for a while and then they catch a rat and put it on trial. Suddenly it makes sense, they’re an absurdist mirror reflecting the actions taking place over in the prison cell and in the kangaroo court set up to try the accused. Is it anti-war? Not really. It would be, but the story is too personal and the actual war has only a bit part in the story. We see still images from the war, a landscape with a dead horse front and centre. There’s a skeleton prone in the cloying mud that becomes a man playing a harmonica. The war is the cause of all we see, but we don’t really see much, if any, of the machinations and logistics of the conflict. The accused opens up early on to the Officer defending him that he has a wife and a son at home. The wife has left him for a neighbour (crash cut to the neighbour sitting up, smoking in the accused’s bed). He has been at war from the start. He’s seen a friend blown to pieces in front of him. The guns, he just couldn’t take the guns anymore so he just started walking home. Mental health and how badly it was dealt with during the war is the real story here. The set is a joke in itself. There are big holes in the wall of the prison cell, big enough for its sole occupant to push aside the barbed wire and escape through. The prison door is a bedstead attached to the wall by wires. The constant rain, enclosed set and close up camerawork used throughout create the claustrophobia that must’ve existed in these situations. There is also a focus on the high level of pomp and ceremony used by the Officers which sets them apart from the down to earth soldiers scuttling about out in the rain. The whole reason I put aside such large amounts of my time to watch films is for these odd little beauties that I know nothing about but that instantly become a favourite after one viewing. I remember feeling the same the first time I saw Sunset Boulevard or Tree of Life. 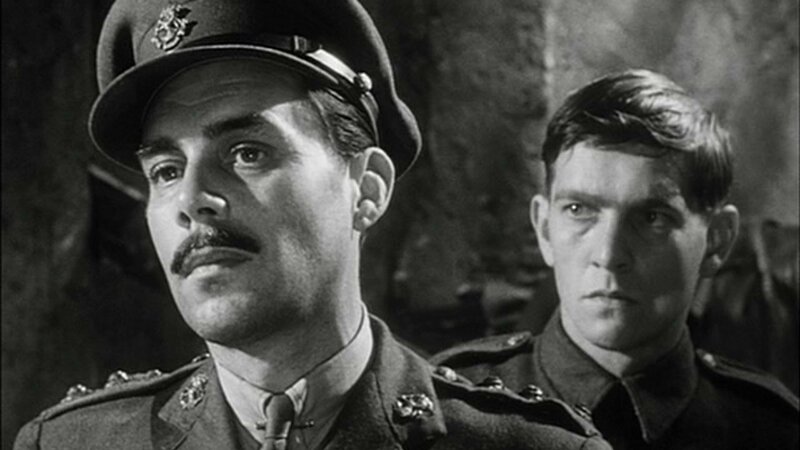 The film finishes with the execution of the accused followed by the reading of a letter home to his parents which breaks the news that he died in action. This leaves us with an even bitterer taste in the mouth than we have following the execution. How many others who ‘Died in Action’ were actually killed by their colleagues for their human reactions to inhumane circumstances? This is a hell of a question to leave us with. A nation mourned it’s sons. 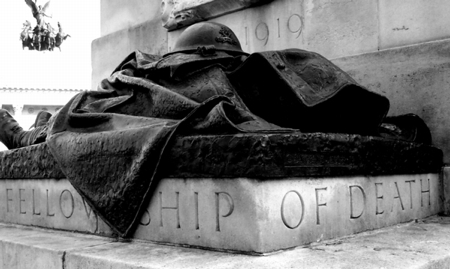 Women wore black well into the 1920’s, well past the unveiling of Lutyen’s memorial to the Unknown Soldier. Was their loss caused by a system unable to accept, or indifferent to, the mental health issues of it’s men? Of course it was and King and Country makes that point brilliantly. You simply must own this. Clicky Clicky here…..NOW!